Dennis Hopper's divorce case is pending. He and his wife separated in January. 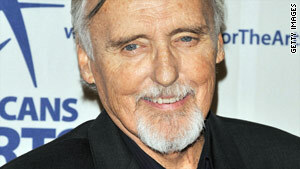 Los Angeles, California (CNN) -- If Dennis Hopper attends the dedication of his star on Hollywood's Walk of Fame Friday, it may be the last time his fans see the actor alive. Hopper is dying of prostate cancer, according to documents filed in his divorce case this week. Hopper's acting career has spanned almost six decades. In the '50s he had roles in several TV shows and films, including "Rebel Without a Cause" (1955) and "Giant" (1956). He became a Hollywood sensation for "Easy Rider," the 1969 film he directed and co-wrote in which he played a dissolute, countercultural biker. He was twice nominated for Oscars. Hopper, 73, is undergoing radical chemotherapy for advanced, metastasized prostate cancer, his doctor said. He is too weak and ill to be questioned by lawyers in the divorce, but attending Friday's ceremony "is a positive experience in every way," his doctor's sworn statement said. Hopper's lawyer has not confirmed if the actor will attend the ceremony in front of the Egyptian Theater on Hollywood Boulevard, but his doctor is recommending it. "I believe the ceremony honoring his career may be something which he will actually enjoy in the company of his daughter, who he hopes will attend with him," Dr. David Argus said. Dennis and Victoria Hopper married 14 years ago and they have a 6-year-old daughter, Galen. They separated in January when he filed for divorce, claiming the stress of their relationship was threatening his life as he battled cancer. "The presence of his estranged wife is hampering Mr. Hopper's present cancer care as she introduces significant additional stress into his life," Argus said. "The less Mr. Hopper has to do with his estranged wife at this time, the more likely he is to have his life extended." Hopper's lawyer, Joseph Mannis, argued that Victoria Hopper, knowing he was "extremely ill and fragile, repeatedly engaged in conduct which appears to have been calculated to subject [Hopper] to severe emotional distress." This distress "subjected [Hopper] to a significant risk of causing his premature death," Mannis wrote. The divorce case is set for an April 5 hearing in Los Angeles County Superior Court, but lawyers for Victoria Hopper are trying to force Dennis Hopper to take part in a deposition. His lawyer and doctor told the judge it could kill him. "Compelling Mr. Hopper to participate in a deposition where he is being asked questions he is compelled to respond to under oath regarding his wife and/or his daughter could actually threaten his ability to survive his current health crisis," Argus wrote. Hopper, who weighs "a little over 100 pounds," is "extremely weak and extremely ill, and he tires very quickly," he said. Emily Davis, Hopper's personal assistant, said in a sworn statement that Hopper is "only able to have brief conversations at times when his nurses permit him to have such conversations and then only for very short periods of time." "He is not able to concentrate and he tires quickly," Davis said. The court filing also contends that Hopper's finances have dwindled with his illness. An affidavit from his accountant said the cost of his cancer treatments exceed his income, which is $58,000 in annual residual payments from his TV and movie roles. His last acting job was last year when he completed the television series "Crash."